Well Sibericat is back showing. 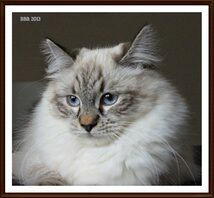 we attended the first allbreed show sanctioned by Chats Canada Cats. This show was held in Joliette Quebec. Misha and his sister Clara both titled. Misha now has two Championships and Clara is now a Premier. Clara ended the day as 2nd Best of the Best Premier. Misha outdid himself this weekend. Finished in top ten 7 out of 8 rings this weekend and on Sunday, was 2nd Best of the Best Kitten in a class of 25 kittens. Way to go Misha. This was his last show as a kitten. Planning on showing him in Belleville in July and Champion him. Our girl Couscous was shown this weekend and did well. She earned her Championship and will now retire from breeding to live with Paul and Helga in the beautiful French countryside with donkeys, dogs, and cats. This weekend was Misha's debut and we are so proud of him. He placed in the top 10 kittens 6 out of 9 times. We received many compliments on him over the weekend and I am very happy we decided to keep him for breeding. He is the future stud at Sibericat.